This lecture introduces the cytoplasmic organelles that produce the energy required for cellular processes to occur. In recent years mitochondria have also been shown to have important roles in other cellular functions, in particular, cell death by apoptosis. This second role will be covered in detail in later lectures in this current series. 1963 There’s DNA in those organelles DNA is directly visualized in first chloroplasts and then mitochondria, from the JCB Archive. 1997 Nobel Prize in Chemistry - The three laureates have performed pioneering work on enzymes that participate in the conversion of the "high-energy" compound adenosine triphosphate (ATP). Paul D. Boyer and John E. Walker "for their elucidation of the enzymatic mechanism underlying the synthesis of adenosine triphosphate (ATP)"
flat discs usually 2 to 10 micrometer in diameter and 1 micrometer thick. Spermatozoa mitochondria (paternal) can enter oocyte at fertilisation. Mitochondrial targeting signal (MTS) - alternating amino acid pattern (amphipathic helix) with a few hydrophobic amino acids and a few plus-charged amino acids at the N terminus. Mitochondria in addition to energy production, have a second major function related to programmed cell death by apoptosis. Mitochondria isolation using magnetic beads conjugated to antibodies to mitochondrial surface markers. MitoTracker probes are cell-permeant mitochondrion-selective dyes. 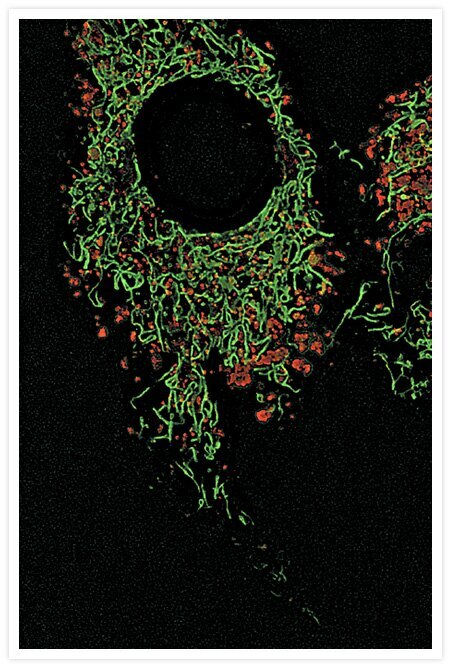 Healthy cells - accumulates and aggregates in the mitocondria, bright red fluorescence. 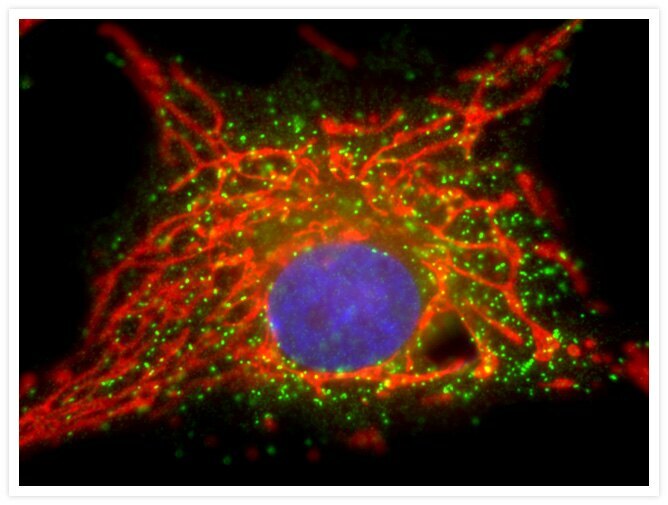 Apoptotic cells - altered mitochondrial transmembrane potential causes dye to remain in the cytoplasm in monomer form, green fluorescence. Microarray of both strands of the entire human mitochondrial coding sequence (15,451 bp). oligonucleotide probes synthesized using standard photolithography and solid-phase synthesis, and is able to sequence >29 kb of double-stranded DNA in a single assay. Integration can appear as neutral polymorphism or associated with human diseases (insertion of mtDNA into genes,5 known cases), the mitochondrial genome remains intact in the individuals. insertion at the breakpoint junction of a reciprocal translocation between chromosome 9 and 11.
insertion into exon 2 of MCOLN1, eliminated proper splicing of the gene (mucolipidosis IV). "Mitochondrial mutation is frequent in salivary ACCs. The high incidence of amino acid changing mutations implicates alterations in aerobic respiration in ACC carcinogenesis. D-loop mutations are of unclear significance, but may be associated with alterations in transcription or replication." Mitochondrial replication factories DNA replication factories in mitochondria divide even in the absence of mitochondrial DNA, according to Meeusen and Nunnari. Apoptotic cells show a transient loss in mitochondrial membrane potential Waterhouse et al. suggest that the transient loss of mitochondrial membrane potential that can be seen in individual apoptotic cells may be masked by cell-to-cell asynchrony when looking at a population of cells. Mitochondria slow down for calcium Mitochondria move along microtubules, but Yi et al. find that they slow down when calcium levels rise, probably so that they can help buffer the ion back to normal levels. This page was last edited on 13 April 2017, at 11:25.